Traditional Mexican cooking includes grilling, frying and steaming over an open fire or stove. Corn or maize, in all its variations, was the main food source along with beans, avocados, chili peppers, and Nopal cactus. Spices and herbs were also important additions to their traditional dishes. ~A comal is a smooth, flat griddle used to cook tortillas as well as other foods. In early times, the comal was used over an open fire. The word comal has its origins in the Aztec language. The Comals were originally made of clay; today, they are also available in cast iron and are made to fit easily over burners on a stove. Notice that the terra cotta comal is concave in design. ~A horno is a mud adobe oven built outdoors and usually placed under a ramada for shade. Traditionally, it has a beehive shape and burning wood is used as its source of heat. Horno is the Spanish word for oven or furnace; it was introduced to New World inhabitants by the conquistadores. In order to bake bread, wood fires are burned to heat the adobe oven and then the embers and ashes are removed and the bread is placed into the horno to bake. For steaming corn, the embers are doused with water to make steam prior to placing the corn in the oven. Meats are also cooked in the oven, but the embers are pushed to the back of the oven, rather than removed. ~Chili peppers are native to the Americas, but different varieties are found all over the world today. Basically there are three types of chili peppers: bell peppers, sweet peppers and hot peppers. The spelling of chilies varies and all spellings are correct. Possible variations include: chili, chile, or chilli. Chili peppers (dried, fresh, or powdered) are used extensively in Mexican dishes. One of Esperanza’s cooking chores was to help grind lime-soaked corn or maize into masa or corn dough for tortillas. To complete this task, she used a grinding stone or metate with a hand-held stone called a mano. Although she thought it was hard work, Esperanza had successfully mastered the grinding of the maize into masa, but she had a difficult time with shaping the tortillas into circles and cooking them evenly. Re-read page 13 to refresh your memory about her “burnt tortillas” and the taunting she endured from her cousin, María Elena, about her misshapen tortillas. Esperanza had to make corn tortillas for dinner. Not her favorite job. She went into the kitchen and got the bucket of corn kernels soaking in lime water. Carefully, she carried it to the porch, setting it next to the large grinding stone called a metate. Scooping the corn out of the pot with a slotted spoon, she dropped it onto the metate, then pounded it into dough with a mano, a grinding stone that fit into her hand. Whew, it was hard work. When she had ground enough masa for dinner, she pinched a small ball, and rapidly patted it into a tortilla. The first try resembled a triangle more than the perfect round shapes that Mamá and María Elena made. Esperanza sighed, put the tortilla in a basket, and went onto the next week. Note: You will need two days preparation for tortillas made from dried kernels because they need to be soaked in water for twenty-four hours before cleaning and grinding. Place the dried hominy kernels in a large pot with enough water to cover the kernels. Add the lime and stir into water and kernel mixture until dissolved. Simmer the kernels for 45 minutes to 1 hour, or until the skins are loose. Remove from heat and allow them to soak for 24 hours. IMPORTANT: Rinse the kernels thoroughly in at least three changes of water, to be certain that the lime has been completely rinsed off. Grind the kernels to a paste-like consistency, using either a traditional metate y mano or a food processor. Add the salt and enough warm water to make a sticky-dough. Let the dough rest for 5 minutes before using it in a recipe for tortillas or other masa-based dishes. Separate the dough into equal-sized balls; then slightly flatten them with the palm of your hand. Place a wet towel or a plastic cover to keep dough from drying out. Note: If you have a specialty Mexican market nearby, you can purchase the masa dough freshly made and ready to press or roll out into tortillas. Most supermarkets carry masa in a specialty aisle of the store. Ask a store clerk where you can find this product. If the dough is too crumbly, add a tablespoon of water. Separate the dough into equal-sized balls. Slightly flatten the balls of dough with the palm of your hand. Place a wet towel or a plastic cover the dough to keep it from drying out. Place a floured plastic bag on a board or countertop. Place a slightly flattened ball of dough in the center of the plastic bag. Place a second floured plastic bag over the slightly flattened ball of dough. Use a rolling pin to roll out the tortilla into a circle six to seven inches in diameter of the right thickness. Use your finger to smooth any ragged edges. Remove the top plastic bag and then flip the plastic bag over in order to remove the tortilla from the 2nd plastic bag. Repeat until all of the dough balls are formed into tortillas. KEEP tortillas separated from one another with cling-wrap. Place a floured plastic bag on the bottom half of a tortilla press. Place a second floured plastic bag over the top of the slightly flattened ball of dough. Close the lid and press down on the handle. Remove perfectly rounded tortilla from the press. KEEP tortillas separated from one another with cling-wrap or waxed paper. Repeat until all of the dough balls are made into tortillas. Heat a heavy cast iron skillet, griddle or comal over high heat. Once you see some bubbles form or see it puff (about 30 seconds), flip the tortilla over with a spatula. Cook for 30 seconds on the second side. Small brown spots are fine. Place cooked tortillas into a basket covered with a towel in order to keep them warm. If you want to re-heat them for later use, then place them in a warm oven for a few minutes. Two dishes eaten by Esperanza and her family are more complicated to make. Consider ordering these from an authentic Mexican restaurant in order to taste these wonderful, traditional soups and stews. Nopales are a vegetable made from the young pads (leaves) of the prickly pear cactus or opuntia, which is native to Mexico and other places around the world. In Mexico, the plant is eaten commonly and is an ingredient in many Mexican dishes. Click for more information on Nopales. The green or purple pads are flat, hand-sized and are the most juicy and tender in the spring. They have a similar taste as green beans. The spines on the pads need to be carefully removed in order to prepare and cook the pads. Today nopales can be purchased fresh, canned or even dried in many supermarkets on the specialty aisle. Optional: a small amount of diced onion can be sautéed before the nopales and added to the eggs. Purchase nopales that have been thoroughly washed, with spines and nodules removed. Slice the pads into bite-size pieces. Melt a small amount of butter in a frying pan. Sauté the sliced pads for about 5 minutes on medium high heat. Beat the eggs with a whisk in a mixing bowl; add shredded cheese and the sautéed cactus pieces. Pour the egg mixture into a skillet and scramble it. Serve warm with soft tortillas and salsa. Pinto beans are a staple of Mexican cuisine. Place the beans into a large pot. Soak the beans overnight in warm water to soften them. In the morning, drain off the water. Cover softened beans with clean water. Turn down the heat to medium and cook the beans until they are soft and almost done – about two hours. Carefully add the beans and mix well with the oil. Fry the beans for approximately 3 to 5 minutes. When done frying, mash the beans with a potato masher; you can mash it entirely or leave some beans whole. Serve with optional chopped onions and cheese. On page 99 in Esperanza Means Hope, Mamá packed Papá and Tío Francisco some food in cotton bags. She included cornmeal and brown sugar to make pinole. Pinole is coarse flour made from ground toasted corn kernels and sometimes mixed with a variety of ground seeds or herbs. It can be made into a drink, a mush-like food or corn bread. For a cold drink, use cold milk or water. For a hot drink boil the milk or water. Pour all ingredients into a glass. Pour the appropriate amount of hot or cold milk or water to fill the glass. Add a dash of optional cinnamon and enjoy! Whisk in remaining ingredients until frothy and serve in mugs. Mix corn through baking soda well. Turn 1⁄2 batter into greased 8” or 9” pan. Sprinkle with 1⁄2 cheese, the chilies, and then the rest of the cheese. Let cool 15 minutes. Cut into squares. A mature saguaro cactus is at least 50 feet tall or even taller, and can weigh between 6 to 7 tons when filled with water. Saguaros can live to be 200 years old. Most begin to develop arms when they are 50 years old. The saguaro has a tough, waxy skin that holds in water and covers its structural ribs. Skin folds or what resembles pleats allow it to expand when water is abundant and to shrink when it is not. It has spines to protect it from animals and to give it some shade. Its shallow and spread-out root system allows it to collect and then store as much rainwater as possible. 8 – 10 feet tall during the months of May or in early June; the fruit matures in July and August at which time it can be harvested. The waxy, cream-white flowers are three inches in diameter; they emerge at night and then stay open only until the following afternoon. Bats, birds or insects must pollinate the flowers within less than a 24-hour period in order for it to bear fruit. The fruit is about the size and shape of an egg. The color of the fruit is green and tinged with red when fully ripe. The fruit consists of an outer coat or skin filled with a red pulp, containing over a thousand small, black, smooth seeds. The fruit, when mature, bursts at the top and exposes the pulp. After a few days’ exposure to the sun, the fruit dries to about one third its original size, and then the whole mass drops out of the skin. At this point, the fruit has the consistency of a dried fig and has a sweet taste. Gather saguaro cactus fruit. Put 6 cups of the pulp in a pot and add water until half of the pulp is covered. Soak the pulp for 1 1/2 hours. Stir every now and then. Put the pot over low heat and cook for 30 to 40 minutes. Separate the pulp from the liquid, saving the pulp. Boil the liquid very slowly, stirring constantly, until it turns into syrup. Then mash the pulp and put through a strainer to remove the seeds. Combine the remaining pulp with the syrup until the mixture is the consistency of jam. When it looks like jam, it is jam. In Chapter Thirteen of Esperanza Means Hope, Esperanza and Carlos collected a basket full of the saguaro fruit using a long cross-topped pole to detach the fruit and burlap bags to catch the fruit; jam is one of Carlos’ favorite treats and Esperanza’s mother planned to make some for him and the rest of the family. The candy or confectioner’s industry developed rapidly in the beginning of the 19th century and by the mid-1800s there was a “penny” candy craze going on in the country. There were 380 candy manufacturers in the nation making all sorts of hard candies and experimenting with flavors and new innovations in size, colors and even shapes. The “chocolate” candy rage had not yet taken over. Homemade hard candies, such as lemon drops and peppermint sticks, became easily accessible. General stores began to sell hard candies by weight from an array of colorful glass jars. They would then package the selected candies in small paper bags to take home. These were known as “penny” candies. The ingredients for hard candy are basically: sugar, corn syrup, water, food coloring and flavorings. The sugar mixture is brought to a boil…and yummy, sweet candy is the result. Temperatures matter in making candy. Candies are categorized by their hardness, and hardness is dependent on the temperature to which the sugar is heated. Sugar cooked at a low temperature results in chewy candy; medium heating results in a soft candy; and sugar cooked at a high temperature becomes hard candy. Pour sugar, corn syrup, water and salt into a saucepan. Stir constantly over low heat until the sugar is dissolved. Increase heat and cook until the thermometer registers 250° which is the firm ball stage of candy making. Continue to cook with occasional stirring until the thermometer reaches 300° which is the brittle stage. Pour candy into a buttered shallow pan, such as a cake pan. While warm, use a table knife to score the candy into squares, so that the candy can more easily break into pieces when it has cooled. When cooled, break into pieces and enjoy with friends! The various species of yucca plants were important to many native Southwest tribes. Many used the sharp-pointed, waxy leaves for weaving. The Apaches used the long flower stalks and creamy white blossoms as a source of food. Most importantly, the roots of the yucca provided many Native Americans with a great natural shampoo and laundry soap because of its lathering properties. 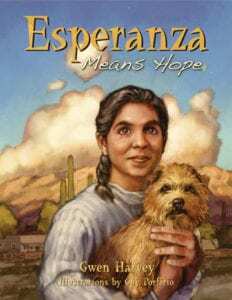 In Chapter Six of Esperanza Means Hope, Esperanza’s father punished her by making her help Rosa, a hired Papago Indian woman, wash the family’s laundry at the acequia madre (the main irrigation ditch). At the ditch, they wet the clothes, applied soap, pounded them against the rocks and then hung them on the surrounding bushes to dry. Esperanza brought homemade lard soap to wash her clothes, while Rosa brought yucca root soap. Rosa remarked that yucca root soap was much easier on the clothes; Esperanza disagreed. Follow the directions below to make your own yucca root soap, similar to the soap that Rosa would have made and used in the 1870s. You will need to make this soap with the assistance of an adult! Clean the yucca root thoroughly using a vegetable brush to remove any loose dirt; loosen the skin as you handle the washed root. Peel off the outer layer of skin from the root using a vegetable peeler. Make certain to not soil the inner part of the root with removed dirt. AN ADULT SHOULD COMPLETE THIS STEP. Chop the root into small pieces using a sharp chef’s knife. Yucca roots are sticky and difficult to work with, so this may take some effort to complete. Pulverize the smaller bits of yucca root in a blender to make a pulpy substance. Place yucca pulp in a bowl and add 15 to 20 drops of your favorite essential oil so that the soap has an aroma. Use an electric mixer to work in the essential oil. Line a cake pan with wax paper and spread the yucca root pulp and essential oil mixture onto the paper. Use a narrow pan so that the bars of soap are thick. Set the pan in the sun to dry (summer heat) or bake in an oven at 200-degrees for an hour until the soap is dry to the touch. AN ADULT SHOULD COMPLETE THIS STEP. Lastly, cut the dried yucca pulp mixture into bars of soap using a regular kitchen knife. The yucca root soap is ready to use. It tells of Knoon-shee, a lovely Chinese maiden, whose affections were bestowed upon her father’s secretary, Chang, but who was commanded by her parents to wed a wealthy rival suitor. She refused to comply with their wishes, whereupon her enraged father locked her up in the little house just visible on the left of the temple. From here she contrived to send a message to her lover, ‘Gather thy blossom, ere it be stolen.’ Thus encouraged, Chang succeeded in entering the apple orchard and carrying off his beloved. So we see them hurrying over the bridge. Knoon-shee with a distaff, and Chang carrying her box of jewels, while the angry father follows hard after them armed with a whip. The couple made good their escape in the ‘Chinese ship sailing by’ and landed on the island, which can be seen on the left of the picture, where they took refuge in the little wooden house. But the father and discarded suitor tracked them and set fire to the house while they were sleeping; and so the lovers perished. Next morning, from the ashes rose their spirits, in the forms of two doves. And so we see them with out-stretched wings flying off to the realms of eternal happiness. No one knows the origin of this story. It was told in China more than a thousand years ago and brought over to our country from Eastern lands by the Crusaders. The willow pattern, as we know it today, was designed by one Thomas Minton about 1780, and bought from him by Thomas Turner, a famous potter and manager of Shropshire pottery. At that time the craze for collecting souvenirs from the East was at its height and this dainty little design, so typical of Chinese people, instantly became popular. Other potters copied the pattern with some variations, and though at first sight all willow patterns look alike, the different makes can be distinguished by various small details, such as the number of apples, the figures on the bridge, and the design of the crooked fence. All early potters, however, used the same shade of cobalt blue, and though we have since had many other shades of lighter and darker tones, even browns or blacks, the original cobalt blue has always remained first favorite. Few other makes of china are more attractive then a really good specimen of willow pattern, with their exquisite markings and minute detail carefully and accurately copied. Appetizer: (optional) ~Esperanza and Carlos ate canned peaches that were left behind in the cave by the cattle rustlers. They also shared canned peaches with Carlos’ Apache family. Supplying 1849 gold miners with fruit, meat, and vegetables started the demand for canned foods. By the Civil War, around 30 million cans of food were produced annually in the U.S. Research the companies that made canned foods in the mid-1800s. For example, the Campbell Soup Company started in 1869. What other canned food companies from today, started in the mid-1800s? Make a list. Main Course: (select one) ~Click to watch how they harvest saguaro fruit, cook it and make syrups. Study the beautiful photographs. Write a summary of what you learned from these web pages. ~With an adult, select one of the center recipes and make a traditional Mexican-American dish, yucca root soap or hard candy. Share your cooking and eating experiences during a show-and-tell at school. ~Design your own Mexican-American meal menu. Include your favorite Mexican-American dishes; add enticing pictures. Display in your classroom. ~Research traditional Apache foods and compare them to the Mexican-American cuisine on an 8 X 11 sized poster. Can you find a recipe for kneel down bread? ~Make a string of chili peppers or ristras to hang and dry out in your house. Find directions on how to make chili powder out of dried peppers. Post for classmates to view. Side Dishes: (select two) ~Research nectar-eating bats and explain their role in pollinating the saguaro cactus blossoms. Write a one-page report about them. ~The prickly pear cactus also bears a fruit (pear) that can be used to make a variety of jellies, jams and drinks. Locate a prickly pear cactus recipe and post it on your classroom website. ~Turn to page 34 in Esperanza Means Hope. Read the list of delicacies served at the Ochoa’s party. Make a drawing of the table with the various foods spread out on a white tablecloth. Don’t forget to draw the jellied pigs’ feet! ~When Lt. McKinney and Sgt. Polk stay for dinner at Esperanza’s house, she sets the table with the good china – the Blue Willow plates. Read the “Blue Willow Pattern Legend” from the center or read the book, Blue Willow by Pamela Conrad. Then draw a circle “china plate” pattern to illustrate any part of the story of Esperanza and her family. You can only use a blue colored pencil, blue marker or blue paint to illustrate their story. ~Click to watch the YouTube videos made by students about the legend of the Blue Willow plate. The Story of the Willow Plate and click to watch the Willow Pattern Story. Make your own digital or animated story of any part of Esperanza and her family’s story using a blue pattern model. ~Research chili peppers and find out the following information: its history, culinary uses, varieties, heat intensity and nutritional value. Make a chili pepper shaped booklet with your information inside to share with classmates. ~Make a labeled display of different chili peppers (real or pictures) and gather information from classmates about their experiences with “hot” jalapeños peppers or chili pepper products. Dessert (optional) ~Research the types of candy that Lord and Williams Store in Tucson, 1876 probably sold as penny candy. Make a list of 10 different candies that Pinto could have chosen to buy. Make butterscotch candy your #1 candy. Find 9 more candies to complete your list. ~Find other recipes for Mexican desserts. Display the recipes to share. True or False: Place a T or F in front of each statement. If the statement is false, make it correct by changing the information. _____ Saguaro cactus can live to be 200 years old. _____ Saguaro cactus begin to bloom when they are 50 years old. _____ Saguaro cactus flowers stay open for pollination less then 24 hours. _____ People shake the saguaro cactus to remove its fruit. _____ Corn dough is called mesa in Spanish. _____ Nopales taste like lima beans. _____ Nopales are a fruit. _____ Frijoles refritos means fried twice. _____ Pinole flour contains ground toasted corn kernels, other ground seeds and herbs. Pinole can be made into ______________, ______________ or _________________________. A comal is a _______________, ______________ griddle used to cook tortillas and other foods. Main foods of traditional Mexican cuisine are ___________, ______________, ______________, _________________ and _________________. Horno means ______________ in Spanish and it is shaped like a ___________________. The three main categories of chili peppers are _________________, _______________________ and _______________________. 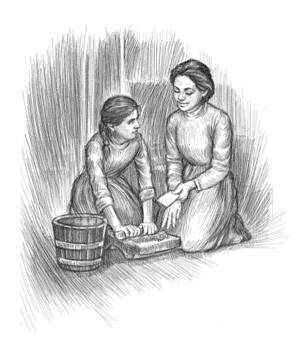 Esperanza’s family used ____________ soap and Rosa used ______________ soap. The _______________________ used to cook sugar in candy causes it to have different levels of hardness. Retell the story of the Blue Willow plate in your own words. T – Saguaro cactus can live to be 200 years old. F – Saguaro cactus begin to bloom when they are 8 – 10 feet tall. T – Saguaro cactus flowers stay open for pollination less then 24 hours. F – People use a cross-topped pole to remove its fruit. F – Corn dough is called masa in Spanish. F – Nopales taste like green beans. F – Nopales are a vegetable. F – Frijoles refritos means fried very well. T – Pinole flour contains ground toasted corn kernels, other ground seeds and herbs. Pinole can be made into a drink, a corn bread or a mush. A comal is a smooth, flat griddle used to cook tortillas and other foods. Main foods of traditional Mexican cuisine are maize, beans, avocados, chili peppers and Nopal cactus. Horno means oven or furnace in Spanish and it is shaped like a beehive. The three main categories of chili peppers are bell peppers, sweet peppers and hot peppers. Esperanza’s family used lard soap and Rosa used yucca root soap. The temperature used to cook sugar in candy causes it to have different levels of hardness. Answers will vary. Self-check your story facts and the sequence of your details.